Offer a sophisticated appeal to any formal suit by adding our Pocket Square Hanky. 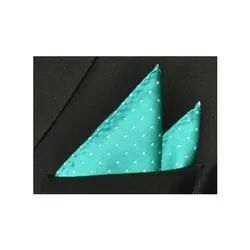 Made from high quality fabric, our Pocket Square Hanky is appreciated for its smooth texture, neat stitching, shrink resistance and colorfastness attributes. We offer Pocket Square Hanky in diverse alluring designs and colors to offer a wide selection to the clients. Furthermore, clients can obtain bulk quantities of Pocket Square Hanky at very reasonable prices from us. Looking for POCKET SQUARE HANKY ?